Vincennes pulls into port at San Diego, California, on 24 October 1988. Vincennes was commissioned in 1985, and saw service in the Pacific before being dispatched to the Persian Gulf in 1988 in support Operation Earnest Will during the Iran–Iraq War. Operating in this capacity the cruiser shot down Iran Air Flight 655 over the Persian Gulf, sparking an international incident between Iran and the United States. Following the cessation of hostilities, Vincennes returned to the Pacific Fleet where she remained for the rest of her active career. Vincennes was decommissioned in 2005 after attempts to retrofit the cruiser with the Mark 41 Vertical Launching System failed, and was initially laid up in the mothball fleet at Naval Base Kitsap, in Bremerton, Washington. In 2010 the vessel was towed to Texas for scrapping, which was completed in 2011. Vincennes was launched on 14 April 1984 and sponsored by Marilyn Quayle, wife of Indiana Senator Dan Quayle. Vincennes was named for the Battle of Vincennes during the American Revolutionary War, while the previous Vincennes heavy cruiser and Vincennes light cruiser were named for the city of Vincennes, Indiana. 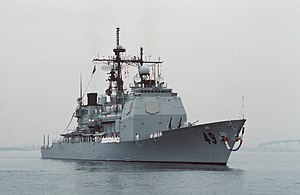 The cruiser was commissioned at Pascagoula on 6 July 1985, Captain George N. Gee in command. The ship normally carried guided missiles, rapid-fire cannons, and two Seahawk LAMPS helicopters for anti-submarine and anti-ship warfare, personnel transfers, and other purposes. Vincennes was the first of the Ticonderoga-class cruisers to enter the Pacific Fleet. Upon commissioning in 1985, Vincennes helped test the SM-2 Block II surface-to-air missile. In May 1986, Vincennes participated in the multinational exercise RIMPAC 86, coordinating the anti-aircraft warfare efforts of two aircraft carriers and more than 40 ships from five nations. Vincennes was deployed in August 1986 to the Western Pacific and Indian Oceans. The ship served as anti-air warfare commander with the Carl Vinson and New Jersey battle groups, operated with the Japan Maritime Self-Defense Force and the Royal Australian Navy, and steamed more than 46,000 nautical miles (85,000 km; 53,000 mi) in waters from the Bering Sea to the Indian Ocean. During the Iran–Iraq War the United States took active measures in the Persian Gulf to protect shipping, mainly oil tankers, that were being threatened by both countries. On 14 April 1988, the guided missile frigate Samuel B. Roberts hit a mine in the Persian Gulf during Operation Earnest Will. Six days later, Vincennes was re-deployed from Fleet Exercise 88-1, sent back to San Diego, California and told to prepare for a six-month deployment. The reason for the haste: Navy leaders decided that they needed an Aegis ship to protect the exit of the damaged Samuel B. Roberts through the Strait of Hormuz. One month later, the cruiser entered the Persian Gulf, and in early July, stood guard in the Strait as the damaged frigate was borne out on the heavy-lift ship Mighty Servant 2. The ship made 14 Hormuz transits during its Earnest Will operations. On 3 July 1988, Vincennes, under the command of Captain Will Rogers III, was on patrol when it was reported that Iranian Revolutionary Guard gun boats had attacked a Pakistani merchant vessel. Vincennes deployed one of her helicopters to investigate. Shortly thereafter Rogers ordered his ship to move off station 50 miles (80 km) to the north. The destroyer flotilla commander ordered Vincennes to return to her original station. Vincennes's helicopter had followed the Revolutionary Guard gunboats into Iranian waters, and while maintaining contact with the boats, came under gunfire from the Iranians. The helicopter crew reported that they had come under fire and with that report, Rogers turned his ship around and, with the frigate Elmer Montgomery, moved to intercept the gunboats. By doing so, Vincennes crossed into Iranian waters herself. As the US ships approached, the Iranian gunboats maneuvered, in what Rogers claimed was a threatening fashion. Rogers requested permission to fire and permission was granted by command, without knowing that Vincennes had crossed into Iranian waters. Vincennes and Elmer Montgomery commenced fire upon the gunboats at 9:43 a.m., scoring several hits on the gunboats, sinking two and damaging another. While Vincennes was firing on the Iranian gunboats, confusion reigned aboard the ship as the tracking of aircraft in the area had become muddled, between Vincennes and other U.S. ships, and on Vincennes itself. Crucially, Vincennes misidentified an Iran Air Airbus A300 civilian airliner, Iran Air Flight 655, as an attacking F-14 Tomcat fighter aircraft. The Iran Air Flight 655 was climbing at the time, and her IFF transponder was on the Mode III civilian code rather than on the purely military Mode II, as recorded by Vincennes's own shipboard Aegis Combat System. Vincennes fired two radar-guided missiles and shot down the Iranian civilian airliner over Iranian airspace in the Strait of Hormuz, killing all 290 passengers and crew on board. The Iranian government has maintained that Vincennes knowingly shot down the civilian aircraft. Iran Air Flight IR655 flew every day out of Bandar Abbas—a civil as well as military airport—on a scheduled passenger flight to Dubai using established air lanes. The Italian navy and another U.S. warship, the frigate Sides, confirmed that the plane was climbing—not diving to attack—at the time of the missile strike. The U.S. radio warnings were only broadcast on 121.5 MHz, not air traffic control frequencies and mistakenly identified the altitude and position of the plane, so the Airbus crew, if they were monitoring "guard," could have misinterpreted the warnings as referring to another aircraft. Captain David Carlson of Sides later said that the destruction of the airliner "marked the horrifying climax to Rogers' aggressiveness". In February 1990, Vincennes was deployed on a third six-month tour of the western Pacific and Indian oceans, with SH-60 helicopters from HSL-45 Detachment 13. The ship coordinated all battle group air events and served as the command-and-control flagship during Harpoon-Ex-90. In July 1990, Vincennes returned home after steaming nearly 100,000 nautical miles (190,000 km; 120,000 mi). In August 1991, Vincennes departed for a fourth western Pacific deployment. Steaming with the aircraft carrier Independence, Vincennes performed duties as the anti-air warfare commander for Battle Group Delta until detaching to participate as the United States representative in MERCUBEX 91, a joint United States and Republic of Singapore Navy exercise. Over the next three months, Vincennes participated in the bilateral exercise Valiant Blitz with the South Korean Navy, the bilateral exercise Annualex 03G with the Japanese Maritime Self Defense Force, and ASWEX 92-1K with the South Korean Navy before reaching Hong Kong to act as the U.S. representative for the Navy Days ceremonies. Vincennes returned from deployment on 21 December 1991. In August 1997, Vincennes changed homeport from San Diego to Yokosuka, Japan, with SH-60B helicopters from HSL-49 Detachment 8G embarked, then steamed to the South Pacific and took part in Exercise Valiant Usher 98-1 with the Belleau Wood amphibious ready group and the Royal Australian Navy destroyer HMAS Perth. The combined exercise took place near Townsend Island, Australia. Vincennes also took part in the U.S. Seventh Fleet's Fleet Battle Experiment Delta (FBE-D) from 24 October 1998, to 2 November 1998, in conjunction with the exercise, Foal Eagle, a regularly scheduled exercise that simulates the military defense of South Korea. Sponsored by the Navy Warfare Development Command, FBE-D was the fourth in a series of experiments that tested new combat systems and procedures at sea. On 12 August 2000, Vincennes completed Sharem 134, a bilateral exercise with several Japanese ships and other U.S. participants. The exercise included a week of undersea warfare training and data collection in the South China Sea. The ship tested her submarine detection, sonar range testing, and use of sonobuoys, and developed new submarine prosecution procedures. The final Sharem events included a "freeplay", which allowed the cruiser to detect and prosecute other submarines, combining many of the tactics and systems tested during Sharem. On 23 March 2001, Vincennes, as part of the Kitty Hawk Battle Group, cruised into Changi Naval Base, the first time a U.S. carrier had moored pierside in Singapore. Vincennes took part in a 23 August 2001 to 27 August 2001, military training exercise called Multi-Sail, which was designed to provide U.S. and Japanese forces interoperability training in multiple warfare areas. Vincennes departed from Yokosuka on 17 September 2001, to conduct operations in support of Operation Enduring Freedom. The ship returned on 18 December 2001 after more than three months at sea. In March 2003 Vincennes was assigned to Destroyer Squadron 15. While there had been several proposals through the 1990s to retrofit the vertical launch system into Vincennes and her four sister ships to extend their service life, none were funded, and all five ships were instead decommissioned; Vincennes herself on 29 June 2005 at San Diego, California and was stricken later that day. She was mothballed at the Naval Inactive Ship Maintenance Facility in Naval Base Kitsap, in Bremerton, Washington. In 2008, Vincennes was slated for scrapping within the next five years along with her sister ships Thomas S. Gates and Yorktown. On 9 July 2010, a contract to scrap Vincennes was issued to International Shipbreaking, Brownsville, Texas. On 21 November 2010, Vincennes arrived via the Panama Canal to International Shipbreaking in Brownsville, Texas, and was completely scrapped by 23 November 2011. Vincennes has been awarded the Navy Meritorious Unit Commendation (16 January – 2 February 1987), the Battle Efficiency "E" three times (1990, 1993, 2001), the Combat Action Ribbon (3 July 1988), the National Defense Service Medal, and the Sea Service Deployment Ribbon with four stars. Vincennes also received a Meritorious Unit Commendation, along with the entire Kitty Hawk battle group, for 9 July 1994 – 9 December 1994. Vincennes also received two Armed Forces Expeditionary Medals for Persian Gulf service, 22 May 1988 – 21 August 1988 and 5 May 1990 – 1 June 1990. The Combat Information Center on board Vincennes in January 1988. Vincennes pulls into port at Pearl Harbor, Hawaii, on 15 April 2005. USS Missouri is visible in the background. Vincennes at commissioning on a rainy 6 July 1985, in Pascagoula, Mississippi. A marker plaque sits in Patrick Henry Square, Vincennes, Indiana, commemorating Vincennes on 25 February 2008. Captain Will C. Rogers III, the then-commanding officer of USS Vincennes speaks during the welcome home ceremony held for the crew at San Diego, California, on 24 October 1988. The ship returned from a six-month deployment to the Western Pacific, Indian Ocean and the Persian Gulf. ^ a b "USS Vincennes Checkmate Cruiser CG 49". Archived from the original on 6 March 2005. Retrieved 26 December 2012. ^ a b "History of USS VINCENNES". Retrieved 26 December 2012. ^ Butterfield, Fox (15 July 1988). "Iran Falls Short in Drive at U.N. To Condemn U.S. in Airbus Case". The New York Times. ^ www.navsea.navy.mil. "Inactiveships – scrappedships". www.navsea.navy.mil. Archived from the original on 5 March 2012. Retrieved 7 February 2012. ^ www.navsea.navy.mil. "Navy Inactive Ships Program SHIP Disposal Program: Dismantling Listing" (PDF). www.navsea.navy.mil. Archived from the original (PDF) on 1 October 2012. Retrieved 7 February 2012. ^ a b "The official U.S. Navy awards site". US Navy. Archived from the original on 15 May 2015. Retrieved 20 July 2014. Crist, David (2012). The Twilight War: The Secret History of America's Thirty-Year Conflict with Iran. New York: Penguin Books. ISBN 978-0-14-312367-5. Fisk, Robert (2005). The Great War For Civilisation. ISBN 978-1-84115-008-6. Rogers, Will and Sharon Rogers (1992). Storm Center: The USS Vincennes and Iran Air Flight 655 : A Personal Account of Tragedy and Terrorism. Annapolis: Naval Institute Press. ISBN 1-55750-727-9. Wikimedia Commons has media related to USS Vincennes (CG-49).